Heaney expands the sea/land relationship of Valediction settling on an extended metaphor that encapsulates a couple’s togetherness and mutual fulfilment (they are on holiday off the west coast of Ireland in a place where land and sea meet and inter-react). The poem should be read in the context of seduction and sensual communion of man and woman. The sea, both elemental force and feminine symbol, seeks to possess the landmass she comes up against. Her Waves have broken constantly since time began onto this southern Irish island-shoreline, reflecting and refracting light (bright … broken glass … dazzling … glinting); her waves have rolled in from distant, exotic lands (Americas) examining and fragmenting matter (sifting … sifting); her waves are pursuing physical possession. The absence Heaney felt so intensely in Valediction affirms the female Devlin-sea as irresistible. Heaney turns things volte-face, suggesting that the sea yielded to him, the male symbol, the island, the immoveable elemental force, keen (rush) to ‘possess’ her by throwing the wide arms of rock around a tide in an embrace that brought surrender (yielded with an ebb, with a soft crash). So which way was it? Who possessed whom? Heaney asserts a happy symbiosis: both he and Marie have benefited, drawing (literally and metaphorically) new meaning from the waves’ collision on the road to fulfilment (full identity). MP eloquently summarises the forces and feelings in play: all four elements are invoked to celebrate the unity and exhilaration of love and marriage … Heaney realises his new secular state of Grace picturing the eternal embrace of land and sea … Metaphors of light mingle with sexual images in a joyous swirl and swell of sound and rhythm … Heaney has associated water with the feminine, the Gaelic, the Catholic, the creative elements in his nature’ (pp. 72-73). The poem is full of musicality, cries out for musical accompaniment. 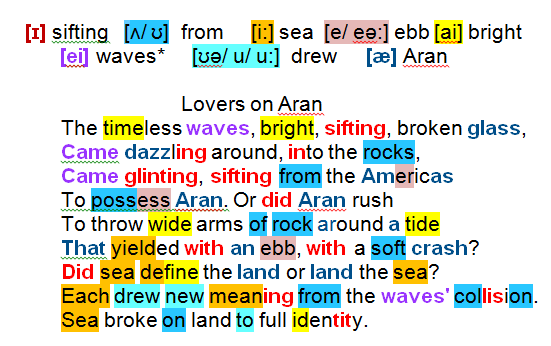 the music of the poem: eight assonant strands are woven into the text; Heaney places them grouped within specific areas to create internal rhymes , or reprises them at intervals or threads them through the text.